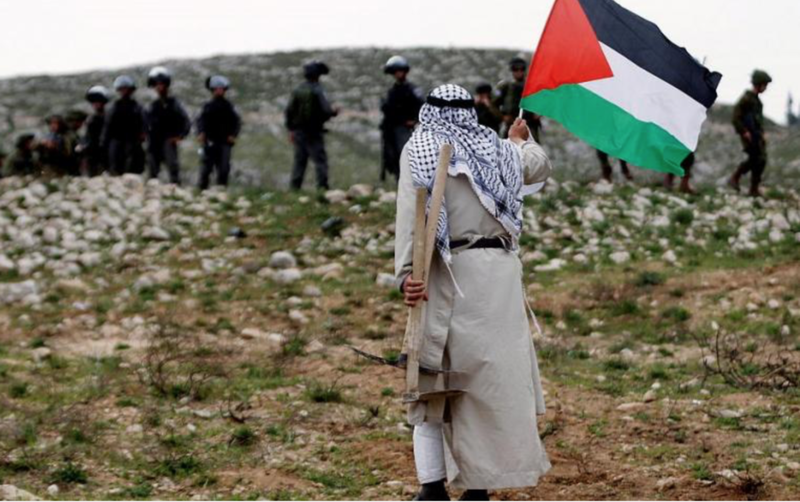 Every March 30, Palestinians commemorate Land Day, the anniversary of a 1976 general strike against Israeli land expropriation by Palestinian citizens of Israel. Israeli police killed six unarmed Palestinian protestors on that day, wounded about a hundred, and arrested hundreds. Forty-three years later, expropriation of Palestinian land continues apace. In 2018 alone, the Palestinian Central Bureau of Statistics reports that hundreds of dunams of Palestinian land were expropriated, over a thousand housing units for Israeli settlers in the West Bank were approved, nine new illegal settlement outposts got the go-ahead and more than 7000 Palestinian trees were uprooted. Decades of such expropriation–not to mention direct displacement–have left Palestinians with only 15% of historic Palestine, which nevertheless remains under Israeli control/occupation. Last Land Day, in 2018, Palestinians in Gaza began the Great Return March to demand an end to the illegal Israeli blockade of the Strip and to demand the ability to return to their lands in what is now Israel. Since then, the United Nations reports that Israeli snipers have shot and killed at least 195 Palestinian demonstrators–including children and clearly marked medics and journalists–and injured close to thirty thousand, a quarter of which with live ammunition. According to a UN inquiry, these killings may amount to war crimes. As we commemorate Land Day and the Great Return March, we draw attention to the historic and ongoing involvement of the Jewish National Fund (JNF), including JNF Canada, in Palestinian displacement and land dispossession. The JNF’s primary purpose has been to acquire and expropriate Palestinian land for Jewish-only benefit–be it in Tel Aviv, East Jerusalem, the Naqab/Negev, Jalil/Galilee, or the West Bank. It also works hand in hand with the Israeli military, the same military that killed 290 Palestinians in 2018 alone. As Jews and as Canadian taxpayers, we refuse to be complicit. We refuse to be silent. Join members of Independent Jewish Voices and thousands of others–including Noam Chomsky, Dr. Gabor Maté, MP Niki Ashton, Ontario MPPs Rima Berns-McGown and Joel Harden, former Canadian diplomat in Israel David Viveash, former UN Disarmament Ambassador Peggy Mason, the Canadian Union of Postal Workers and the Confédération des syndicats nationaux du Québec–in calling on the Canadian government to revoke JNF Canada’s charitable status now! Click here to sign our formal, parliamentary e-petition to the Minister of National Revenue, to which the government is obliged to respond. Click here to make a donation to our #StopJNFCanada campaign of only $30 today! For more information about the #StopJNFCanada campaign, go to stopthejnf.ca. For those in Toronto, please join our Land Day action with Actions4Palestine at Dundas Square on Saturday at 2pm.